The Design that Matters team first visited the town of Bac Giang in October 2009, as part of our second phototherapy field research trip to Vietnam. 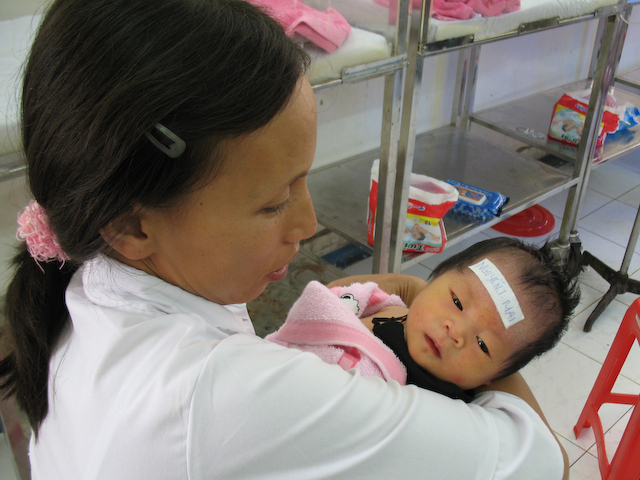 Our goal on that trip was to better understand newborn jaundice and phototherapy, and the gap between existing overhead phototherapy devices and the needs of low-resource hospitals in Southeast Asia. We learned a ton at the Bac Giang District Hospital, one of the busiest facilities we visited on that trip. After slogging through the smoggy morning traffic in Hanoi, past the enormous Canon and Foxconn factories outside the city limits, and then miles and miles of flat and dusty green fields, we arrived in Bac Giang just after lunchtime. The street outside the hospital was crowded with stalls selling baby clothes and snacks. The entrance was buzzing with mopeds. The ward was hot, crowded and very busy. Fathers and grandparents stood waiting in the white tile hallway outside the neonatal intensive care unit (NICU). Exhausted-looking new mothers paced the hallway in their pajamas, or squatted on plastic stool in the NICU feeding their newborns. The NICU walls were lined with bassinets and all of the beeping monitors and buzzing alarms made it sound like a Vegas casino. The experienced and hardworking NICU team at Bac Giang had already received early versions of the MTTS newborn health suite, including their CPAP, overhead phototherapy device and the Bilibed, MTTS’s predecessor to the Firefly newborn phototherapy device (see photo). The NICU team explained that they loved how the Bilibed fit just a single newborn, but they were worried that the lights weren’t bright enough to be clinically effective, and they were frustrated with how hard the device was to keep clean. They also stressed that a great medical device should look modern and reliable. These were all critical design inputs for Firefly. Having learned so much from Bac Giang, we’re thrilled to report that MTTS and Thrive Health have returned to the hospital to install a Firefly phototherapy device! It’s a funny story of connections. As a child, Thrive Health’s Breath of Life program director Luciano Moccia belonged to Boy Scout Troop 1 in Trent, Italy. His brother is now scoutmaster of that troop, and as a volunteer activity the scouts raised the money necessary to donate the Firefly to Bac Giang. Bac Giang serves both the 120,000 people who live in the city, and all of the rural communities in the district. On any given day, the NICU might host more than a dozen newborns. Firefly will allow the hospital to treat jaundiced newborns, including those with severe jaundice that the hospital might otherwise have had to refer to the main pediatric hospital in Hanoi for a dangerous exchange transfusion. Older PostThank You to our Spring Student Teams!